How many times have you told yourself that you are not going to eat any more sugar and then found yourself digging into the next cupcake or candy bar in sight? If you experience sugar cravings (like many people) you might feel like you have no “willpower” when it comes to sweets. You might even feel pretty guilty after you eat something sweet. Well, you’re not alone. While it’s common knowledge that increased sugar consumption has a negative impact on your health, including increased risk for cardiovascular disease and diabetes, it can still be difficult to stay away from sweet flavors. As research suggests, the sweet tooth is universal in cultures around the world and has even played a vital role in human evolution. The problem with sugar arises with overconsumption. Now that sugar is so readily available at gas stations, work, and social events, it makes it harder to just say “no” every time. The good news is that with holistic strategies, you can still have your cake and eat it too. Gone are the days where you need to strictly control and restrict your sugar intake. Instead, focus on these six tools to help reduce your cravings and find healthier alternatives to give you that sweet fix you are looking for. If your blood sugar is swinging from high to low throughout the day, it’s likely that you are going to crave sugar. When your blood sugar is low, it’s common to experience low energy levels along with carbohydrate or sugar cravings to help get your blood sugar back up. Eat your breakfast within one hour of waking up. When you wake up in the morning, your blood sugar is lower because you have been fasting all night. If you eat within one hour of waking up, it helps to stabilize your blood sugar and insulin levels. Make sure to have healthy sugar alternatives on hand wherever you go. Again, getting rid of sugar cravings doesn’t mean that you have to cut out the sweet flavors all together. When everyone is passing around brownies and cookies at your office, you can go to your own secret stash and grab a healthy upgrade. This could be a homemade treat that is made with natural sweeteners or it could be some dark chocolate. Here are some healthy recipes that you can try at home to get you started. It’s no surprise that there is a link between your emotions and eating high-fat, high-sugar foods. If you get stressed or sad and go straight for the tub of ice cream, you might be an emotional sugar eater. There are ways to combat this. In these cases, sugar is a temporary relief to soothe unwanted feelings, but it doesn’t actually fix the problem. If you really want to change your relationship with sugar, you will have to dig a little deeper to support your emotions. A 2016 study showed that participants who got five hours of sleep or less at night showed a 21-percent increase in sugared beverage consumption. Another study showed that the appetite-regulating hormone ghrelin increased when the participants got less sleep, and this elevated ghrelin was associated with a higher intake of carbohydrates and sweets. If you have unhealthy sleep habits such as going to bed too late or watching TV before bed (which can stimulate your mind instead of calming it), it’s time for a change. Experiment with one or two weeks of getting more sleep and notice the difference in your sugar cravings. If you have tried steps 1 to 5 and haven’t noticed a significant reduction in your sugar cravings, there might be something else contributing to your sugar cravings. One common gut imbalance that contributes to increased sugar cravings is a Candida Albicans, also known as a yeast overgrowth. Consult with your doctor or with an alternative medicine practitioner to see if Candida is contributing to your sugar cravings. As you can see, there are many holistic steps that you can take to address your sugar cravings. Once you implement these changes, you will see that sugar cravings are not all about willpower. By addressing your blood sugar stability and emotional state and giving yourself healthy alternatives, you will find that sugar cravings are no longer your enemy. Here in the northern hemisphere it's getting hot, which signals the official start of Pitta season. Whether or not you are dominant in Pitta dosha, it is important to keep cool during this time to balance out all the excessive fire that is around us. Too much Pitta can mean heartburn, ulcers, acid indigestion, acne, or skin rashes. It can also exhibit itself as irritability or anger. To pacify Pitta there are a few simple things we all can do. - Cool, but not ice cold, drinks help to keep Pitta in balance. The idea is to calm that fire, but not put it out completely. Avoid carbonated drinks that tend to disrupt digestion. Pitta tea is delicious chilled! - Choose sweet fruit and juices, like peach and pear, and pure water to stay hydrated. - The Pitta diet calls for more sweet, bitter and astringent tastes. Salads with leafy greens are a great way to get these tastes in. Salads are also cool - ideal for this time of year. It is not uncommon for people to have difficulty digesting raw foods, but during Pitta season, when there is more fire in the environment to support digestion, salads can be a real treat. - Cooling spices, such as mint, fennel, and anise can be added to foods. In a dry skillet, roast the coriander and cumin seeds until nutty. Transfer to a spice grinder and add the cardamom and fennel seeds; process to a fine powder. Put the spices in a bowl with the turmeric, mint, ground ginger and sugar and mix all together. Transfer into a shaker bottle to use whenever you'd like. During Pitta season it is best to avoid super spicy foods, as the abundance of fire can create a Pitta imbalance. When the digestive enzymes are out of whack we get too much acid. It's best to eat three meals a day to keep the digestive fire burning nicely, don't skip meals. Pitta types especially need to avoid those pungent spices such as chilies, cayenne, and black mustard seed; these increase acidity. It would seem like heavy, cold, or sweet foods would cool the acidity. But in reality heavy, cold foods will only make the acidity problem worse by blocking the channels of digestion and metabolism. It's better to cool the digestive fire by cooking with cooling spices, and by eating light desserts with our meal such as fruit crisps. Just a little sweet to balance all that hot and spicy that comes naturally to Pittas! - Get to bed before 10 pm. At 10 pm Pitta time kicks in and we tend to get the munchies. Eating right before bed can disturb sleep. It's important to get that sleep during Pitta time, the hours between 10 pm and 2 am, so that the body gets the restorative rest it needs. - Swimming and other water-based sports are cooling, and therefore ideal during Pitta season. Moonlight is especially soothing, so take that evening stroll after dinner. During the summer, the sun is hot and the days are long. The sun gives us energy for our mind and body, and as a source of Vitamin it has some benefits for our skin. The trick is to protect our skin, without over-protecting it. Ayurveda has some tips for us. - Skin is more sensitive to the sun during Pitta season, so make sure to wear sunscreen when you're out during the day. You can also protect your skin with clothing, hats, long sleeves, and sunglasses. Avoid the mid-day sun. Early morning sun is more gentle to the skin. - Avoid exposure to the sun when angry, hungry or upset. These factors increase Pitta, which makes the skin more susceptible to sun damage. - Cool down skin with a mask made of watermelon puree. Avoid the eye area, and rinse off with lukewarm water after about 15 minutes. - Rosewater is wonderfully soothing to the skin. Dab some on with a cotton ball after exposure to the sun. The healing properties of rose are especially Pitta balancing: cooling, moisturizing, and soothing. The eyes are governed by Pitta, which becomes less balanced as we age, so it's a good idea to implement some Ayurvedic recommendations for eye care now. These days, we spend so much time in front of the computer screen, watching TV, driving, reading, we're using our eyes all the time, and yet we tend to take them for granted and not give them the care they deserve. In Ayurveda, we learn that it is important to take care of our health, and the health of our eyes, while we are healthy. This way we can prevent problems from occurring and improve our vision. - Make sure you get enough sleep. Your eyes need rest just as the rest of your body does. - Wear sunglasses to protect your eyes from direct sunlight. - Make sure you have proper light to work or read in, not too dim or bright. - Take a break from the computer every 30 minutes. Get up, walk around, and look at objects in the distance for awhile. - Try this Yogic eye exercise. Look up for two seconds, then look down for two seconds, then close your eyes for two seconds. Open your eyes, look right as far as you can for two seconds, then look left as far as you can for two seconds, look to the front again, and close your eyes and breath for 10 seconds. Repeat. - Make sure to include foods that are rich in vitamin A in your diet, like carrots, and green, leafy vegetables. - Drink plenty of water to stay hydrated and keep the eyes moist. Avoid caffeine. - In the evening, rest with two cotton balls dipped in rosewater placed over your closed eyes. Rosewater is cooling, and the fragrance is balancing for Pitta. Roses have always been associated with love and romance, so it's no surprise that Ayurveda uses roses as a remedy for the heart. Roses balance Pitta, and particularly Sadhaka Pitta, which is the subdosha of Pitta that governs the emotions and their effect on the heart. In the summer time, Pitta can easily go out of balance, so it's a good time to break out the roses! Roses are cooling, and yet they enhance agni, the digestive fire. This quality makes roses balancing for all three doshas. Rose water is used to cool, moisturize and tone the skin. And the fragrance of the rose enlivens inner beauty as well. If you feel your anger rising, or your Pitta getting out of control, sniff some rose petals and watch the heat of the moment subside. Roses also intensify the experience of happiness and bliss! You can use dried rose petals to make a tea, or put rose petals in your bath water to help distribute the essence of rose to your mind and body. Sandalwood is known in Sanskrit as chandana, which is also a word meaning "excellence." Sandalwood is wonderful at reducing Pitta, as it is cooling and calming for mind and body. The Sandal tree is highly regarded in the Vedic texts, and the heartwood is considered to be sacred. It is an evergreen tree that grows only in some areas of India, Indonesia and Australia. In India, the Sandalwood tree is under the protection and ownership of the Indian government, even when grown on private land. The oil from sandalwood is used in cosmetics, soaps, candles, medicines and perfumes. The outer wood is used mostly for making beads, boxes, and small decorative items. The oil or paste helps to heal skin problems like acne and rashes. Sandalwood acts as a disinfectant, diuretic, expectorant and sedative. It balances the circulatory, digestive, respiratory and nervous systems. Most people only pay attention to their eyes if they have a problem. Yet the hours spent watching TV and working on computers take their toll on eye health. According to Ayurveda, the eyes are one of the most important organs in the body. All five elements play a role in maintaining eye health. Earth (prithivi) governs the muscular part of the eye, fire (tejas) rules the blood vessels, air (vayu) governs the color, water (apu) dominates the white area, and space (akasha) controls the tear ducts and channels. Here are some simple things you can do to prevent eye disease and improve your vision. In general, you don't want to stare continuously at fixed objects in the distance. Blink periodically and look away at short intervals to keep from straining the eyes. At the same time, staring at the TV close up is one of the main causes of myopia (near-sightedness), so watch TV from at least ten feet away--not too near and not too far. Proper light is another factor in eye health, just like your mother told you. Avoid reading or working in either dim light or in bright sunlight. Staring fixedly in the distance or close-up is especially harmful in bright sunlight, especially if you're around water or reflecting objects. Wear sunglasses to protect your eyes in bright sunlight, but not to drive or read with, as this will cause strain. One of the biggest enemies of the eyes is lack of sleep. If you have a tendency to stay up too late, try going to bed just fifteen minutes earlier. Gradually bring your bedtime into alignment with the ayurvedic routine--before 10:00. If you wake up in the night and can't fall back asleep, try Deep Rest. Each morning upon waking (either before or after using the toilet), fill your mouth with water and hold for a few seconds with your eyes closed. Spit it out and repeat 2-3 times. Splash your eyes and face with cool or slightly warm water 10-15 times. Repeat again in the evening when you return from work or school. Caution: Never use hot or icy water on the eyes. Also avoid abrupt temperature changes. For instance, if you're hot and sweaty, wait 10-15 minutes until your body adjusts before splashing cool water on your face and eyes. Yogic eye exercises, if done daily, are a gentle and effective way to prevent vision problems for developing. They are especially recommended for children, but adults can help prevent far-sightedness from developing in middle age, and even people who wear glasses can prevent their vision from getting worse. If you already do yoga regularly, continue with your normal routine because most yogic exercises have a good effect on the eyes. Sit in the Sukhasana (easy pose) with your legs comfortably crossed and your spine, neck and head in a straight line. Look directly to the front at eye-level and breathe normally. This is the position of readiness. Move your eyes upward to the ceiling and stay for two seconds. Look downwards and stay for two seconds. Close your eyes for two seconds. Look toward the right side, as far as your eye will see, for two seconds. Look to the left side for two seconds. Look to the front again. Close your eyes for 6-8 seconds. This completes one round. Start with 2-3 rounds and increase up to four rounds. Rub both palms together quickly for 8-10 seconds. This friction creates a mild heat. Close the eyes and gently place the left palm over the left eye and the right palm over the right eye for one minute. Do not press the eyeballs with the palms, just let them gently rest there. Breathe in and out slowly to release stress. Other poses that strengthen the eyes include the Bhujangasana (snake pose), Surya Namaskara (sun salutes), and Shavasana (rest pose). If you have to stare at a computer screen up close for your job, or spend long hours doing any detailed close-up work, use these tips to banish eye fatigue. 1. Every thirty minutes, look away from the computer and palm your eyes (see above). You can also get up for a short break, stretch or make a phone call. 2. Dampen two wads of cotton with pure Organic Rose Water and place over closed eyes. Relax for 10 minutes with the pads over your eyes. Organic Rose Water has a cooling effect and is especially helpful for tired eyes. You can palm your eyes afterwards. I remember a time when I was young I got upset with two of my friends and stopped talking to them for two years. I can't even remember why I got upset, but at that time it made sense to me to hold on to my hard feelings. At that young age, I thought that my behaviour was reasonable and I didn't understand that the only person I was hurting by holding onto my feelings was myself. Over the years I came to understand more that I didn't need to take the behaviour of another person so personally. That's when forgiving suddenly became easier. What looked like a personal attack before now looked like a behaviour of a person who was suffering, and therefore unable to act from a place of kindness. Taking on this perspective opened me up for a new understanding of seeing my experience of other people more objectively. Not only did I learn to forgive more easily, but it also became easier for me to show up from a place of compassion. Here are a few tips to help you see your situation from a wider perspective when you find it difficult to forgive another person. Understanding where the other person is coming from and how their behaviour has nothing to do with you makes forgiving them a natural response. When someone says or does something that hurts you, they are not reacting directly to you—they are reacting to their own thinking. They are not reacting to the reality as it is, but rather to their own perception of the situation. When you are able to see this at a deeper level, you can become less reactive. If the other person does something that hurts you, instead of taking it personally, try to become curious. What makes them act like that in the first place? You, like everyone else, are always doing your best you can with the tools and knowledge you have in the moment. What looks reasonable to you when you feel the anger burning inside often looks like a mistake afterwards. If you had known this in the middle of the storm of your emotions, you would not have acted from that place. But you didn’t know. This is why you may sometimes do things that you regret later. The more you understand this, the more innocence you can see in every act of unkindness—yours and others’. When you feel stressed, upset, or angry, you lose your ability to see the moment clearly and objectively. Your perspective narrows, your negative emotions blind you momentarily, and you see everything in a more negative light than usual. Your feelings of hurt are overshadowing your experience. When you see this and take a moment to allow your mind to calm down, your understanding of the situation becomes deeper. In the heat of the moment, you might do or say things that you regret later. You might be in the middle of an argument and say something that really hurts the other person. Deep down you know that you don’t really mean what you are saying, but your heated emotions override your ability to think clearly. Every act that comes from a place of unkindness is coming from a mind that is struggling. Whenever you do things that hurt other people, you are suffering inside. Understanding this allows you to forgive others more effortlessly and gives you an opportunity to see your situation from a wider perspective. Not only will you realise that you don’t need to hold onto your negative emotions, but you can also recognise the humanity in every single person. Everything resolves, one way or another, with the understanding that comes when your mind is calm. What all this means is that you can forgive and choose to continue your life without the weight of your past, regardless of whether you still want to have the other person in your life, or not. The stages of life are much like the stages of a caterpillar’s metamorphosis with one key difference: the caterpillar surrenders to the experience of caterpillar to chrysalis to butterfly, trusting its DNA to do its job. Humans have this annoying need to examine and plan for each stage of their evolution. So how can you learn from the butterfly and allow for your evolution without overthinking it? Moving frantically from one life stage to the next can leave you feeling both stressed out and tired. Take your time. The caterpillar never hurries to become a butterfly. When you’re at a crossroads about what to do next, spending some time reflecting on what gave you joy in the last stage of your life will help attune your inner compass and move you forward. For example, if you loved packing healthy lunches for your kids each day, maybe nutrition is your next adventure, or if you loved posting travel pictures from your vacations, maybe photography classes would thrill you. People have turned to nature for generations to find stillness and a deep connection to their true inner self. Experiences like a walkabout—which historically refers to a rite of passage during which indigenous male Australians would live in the wilderness to make the spiritual and traditional transition into manhood—have always been a part of self-discovery. Spend some quiet time in nature. Opening your mind will help you to become curious about the things in life that matter to you. Play with having the perspective of a child. Often searching for life’s next adventure is looked through the lens of the “shoulds” of your upbringing. The cultural, societal, and even political values you once chose don’t need to define you as you move through life. Looking through a child-like lens can help you see your choice with a new perspective. At some point in your life, you stopped thinking that you were capable of choosing wisely for yourself. If you don’t know who you are and what you want, what makes you think anyone else will be able to tell you? Of course, you can ask opinions about what your strengths are and how others see you, but ultimately, it comes down to you. Your life. Your choice. Time spent in meditation allows you to connect to your mind, body, and spirit. You begin to identify yourself, much like a wave, and then see how the wave is part of the ocean. It connects you to the endless possibilities that lie in the pure potential of this connection. It also gets you out of the fight-or-flight part of your brain that impedes decision-making. Sometimes the need for a clear end goal can leave you paralysed. Getting started on a trajectory that can lead to multiple good outcomes can stop the analysis paralysis that accompanies a search for your perfect next steps. Sometimes settling for perfectly good allows you to remove some pressure and begin. When you get to the top of the mountain, it rarely matters what path you took. Hesitation is your enemy. When you have decided on a path, begin walking it. If you want to go back to school, register. If you want to get back to work, send your resume out. Intention requires action. Sometimes it’s easy to get confused between a role you play and who you actually are. If you are a mother, when your children are grown and need you less, you are still their mother. When a doctor retires, he is still a doctor. When your parents need you to care for them, you are still their child. Remember, with every transition, you are still you. The caterpillar is still the caterpillar even when she becomes a butterfly. When you get stuck, even temporarily, trying to figure out who you are and what you want, remember there is no deadline to make a change, and with any luck you will always be evolving and changing. Stay present and trust that who you are is exactly who you need to be right now. Where you are going next will become apparent when the time is right. Instead of worrying, which is like paying interest before you have a loan, practice being present. Life has a way of working itself out once you get out of your own way. Time is flying by, and your intention to set a new habit or pursue a certain goal might have been left in the dust. If that’s the case, don’t fret–there’s still time to get back on the right track. 1. What Was Your Original Intention? Perhaps life got busy, and you haven’t thought of your January intention in a while. Look back in your journal or riffle through your mental files to recall what goal you set out to accomplish. Once you find it, try writing it down again. Research indicates that writing down your goal could significantly boost your chances of accomplishing it. After you write down your goal, post it somewhere highly visible, like your bathroom mirror or on your refrigerator. The reminder will keep your intention front-of-mind. 2. To What Value Is This Goal Tied? One of my friends wanted to start running and had a difficult time motivating herself. She realised that by getting in shape, she would inspire her children to lead healthy lives. Since family is one of her core values, this epiphany inspired her more than anything else could. She trained for and ran a 10K, and her children greeted her with big hugs at the finish line. Research suggests that your core values can offer you willpower when the going gets tough. By linking your goal to one of your core values, you’ll be more likely to stick with it. Are you unsure about your core values? 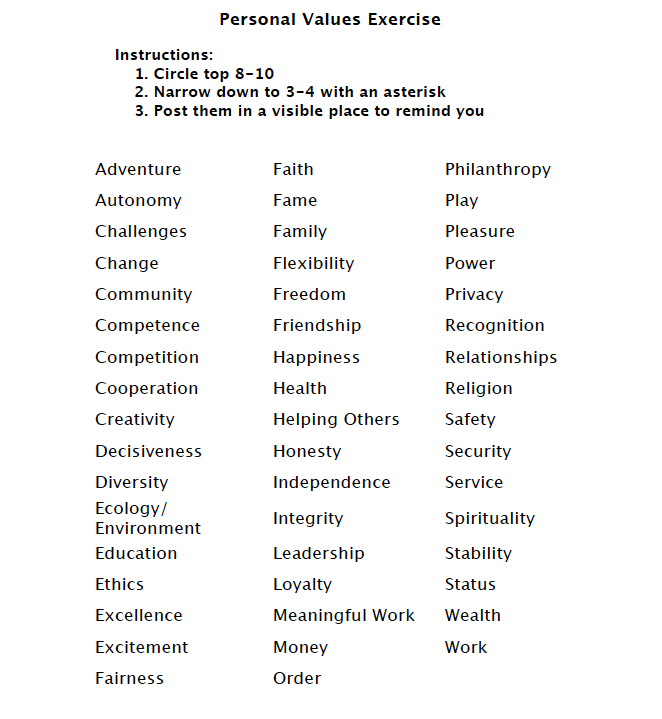 Check out this list of values to find the ones that resonate most. 3. What Would It Feel Like to Take the First Step? Athletes often use visualisation techniques to practice their movements off the court or field, and you can use a similar technique to practice attaining your goal. Begin by finding a comfortable position. Close your eyes and settle your mind with a few deep and cleansing breaths. Imagine yourself accomplishing your goal or taking the first step toward accomplishing your goal. Try to create the moment with as much detail as possible by noticing where you are, what you see, what you’re doing, and who is there. Now tune into your sensations. What do you feel and where do you feel the sensation? What does it feel like to meet your goal or to take the first step toward that goal? Hold on to that feeling for a moment longer before opening your eyes. 4. What Words of Encouragement Can I Offer Myself? You may often rely on others to boost you when you’re feeling low, but what happens when your friends and family aren’t around? You can offer yourself the same encouraging words you would share with a friend who needs support. See what words work best for you, and offer them to yourself. Try phrases like, “Sara, you’ve got this,” or “Sara, you can do it.” Address yourself using your own name to help hammer home these motivating sentiments. 5. Who Can Support Me? As I mentioned previously, writing down your intention may help you accomplish it. Your percentage of attaining it goes up even more if you share your goal with someone else, according to a study out of Dominican University. Find a friend, family member, or co-worker who will encourage you and hold you accountable. Two of my friends have been my meditation accountability buddies for the past four years, and their encouragement has helped me keep my practice as a priority. What other steps do you plan to make keep your goals for the year on track? Doing what you can to prevent heart attacks, strokes, and death is an important endeavour in your pursuit of a healthy lifestyle. And often, lowering your cholesterol is part of that conversation with your doctor or medical practitioner. However, the first step to take when assessing the importance of lowering your cholesterol is to identify your primary goal. For instance, is the goal to achieve better lab numbers? Or is it to reduce the risk of heart attack, stroke, and death? The answer should be fairly obvious. Unfortunately, patients and doctors alike can frequently lose sight of the ultimate goal and get caught up in the numbers. It is a common misconception that to lower your risk of heart disease, you must lower your cholesterol. According to recent studies, that may not be the case. For example, the PREDIMED study demonstrated that those following a Mediterranean-style diet, full of fruits, vegetables, nuts, olive oil, and fish had a decreased risk of cardiovascular disease compared to the control group following a lower-fat control diet. What’s even more impressive is that the risk of cardiovascular disease was reduced even though the LDL cholesterol (often referred to as the “bad” cholesterol) didn’t decrease. In addition, a recent study in NEJM found that in individuals at the highest genetic risk for heart disease, healthy lifestyle habits can cut the risk of heart attacks in half. Once again, the study showed no meaningful reduction in LDL cholesterol. Clearly, there is more to being healthy and reducing the risk of cardiovascular disease than simply lowering LDL cholesterol. A common prescription for lowering LDL cholesterol is the use of statin drugs, which reduce the production of cholesterol by the liver. Statin trials, such as the Jupiter study, demonstrated that statins can help lower risk of cardiovascular disease not just by lowering the LDL cholesterol, but also by lowering the body’s inflammation. In this trial, only those who had a reduction in the hsCRP (a measurement of inflammation) benefitted from the statin drug. Those who lowered their LDL cholesterol, but not their hsCRP, did not benefit nearly as much. If the goal then is to reduce your body’s inflammation to reduce the risk of heart attacks and death, a lifestyle change is paramount for treatment. Eating healthy, fresh foods can have an anti-inflammatory effect on your body. Unfortunately, there has never been a randomized trial comparing comprehensive lifestyle intervention to statins and the subsequent risk of heart attacks and death. However, since lifestyle changes can be effective (as evidenced by the studies referenced above), and they come without the adverse side effects of some medications, purposeful lifestyle interventions should be the initial therapy of choice for primary reduction of cardiovascular risk. How high is my calculated cardiovascular risk? How much will a statin reduce that risk? What else can be done to better define my risk (i.e., coronary calcium score)? What else can be done to lower my risk (i.e., intensive lifestyle modifications)? By answering these questions, you can make a more informed decision about whether a statin or other drug is needed to significantly lower the risk of heart attack, stroke, and death. However you choose to move forward, it’s your decision to make after hearing professional opinions, taking into account your own goals and fears. Unfortunately, current guidelines under appreciate the beneficial effects of purposeful lifestyle interventions. The ultimate goal is improving your health, reducing the risk of chronic disease and death, and improving your quality of life. Nutrition, exercise, and stress management are an ideal place to start. As springtime begins in the Northern Hemisphere, the landscape is alive with nature’s beautiful expression, enlivening our senses with an infinite variety of colour, scents, and forms. Unfortunately, for those of us with sensitivities to pollen, spring can also be a time of watery eyes, chapped noses, and other allergic symptoms. The healing system known as Ayurveda offers some time-honoured remedies to relieve your allergies and allow you to enjoy the gifts of the season. Increase your intake of pungent foods, which will help relieve the congestion associated with allergies and the Kapha dosha. Use herbs that ignite your digestive fire, including fresh ginger, coriander, fennel, and long pepper. One way to enjoy ginger is in the form of ginger tree. Find a simple ginger tea recipe here. Favour foods rich in omega-3 fatty acids — flax seed, walnuts, leafy green vegetables, soy, and cold-water fish. Use a neti pot and herbal nasya oil to clean your sinus passages. A neti pot is a small container with a spout that you gently place inside your nostrils in order to administer a warm salt water solution. This procedure reduces the concentration of allergens and nourishes the mucous membranes to reduce allergic reactions. If you use a neti pot a couple of times a day, you may be able to avoid using decongestants and antihistamines. Watch a video with instructions for using a neti pot here. Take the Ayurvedic remedy trikatu to help clear and drain your sinuses. Consider using the Ayurvedic herb boswellia (Boswellia serrata)¸ which has been shown to have anti-inflammatory and antiasthmatic properties. You can also try the herb butterbur (Petasites hybridus), which has been shown to reduce the symptoms of allergic rhinitis. Drink plenty of fluids — water, juices, and herbal teas. The days are longer and lighter, and that can only mean one thing: it’s time to play outside! Whether you grew up camping every summer or you’re a nature newbie, everyone can use more Vitamin N these days (that’s N for Nature!). Whether you’re headed out on a road trip, a day hike, or a month-long backpacking trip, make sure you think ahead and practice these six safety tips. Although most outdoor experiences are safe, it’s a good idea to tell someone close to you exactly where you’re going, when you’re leaving, and around what time you expect to be back. That way, someone will know to send help if you’re not back when planned. Keep in mind: sharing your plan with someone who cares about you is very different than posting your whereabouts on social media. Although it’s fun to share photos and stories of your adventures on Instagram, Facebook and Twitter, posting for all the world to see (read: strangers and enemies) that you’re running solo on a particular trail or that your house will be empty for several days is just not a good idea. Use common sense and keep yourself and your property safe by telling someone—but not everyone—where you’ll be. Do you know anything about where you’re traveling? Did you pack a raincoat just in case? Does your headlamp have fresh batteries? Are you physically prepared for the terrain you’ll be treading? Did you train and stretch? Are you mentally prepared to be out of touch from email/phone? Are you ready to be immersed in nature for the duration of your trip? Are you aware of where you are emotionally and sure that you’ll keep yourself safe? Bring enough. Bring a lot. Drink it! Although you can go without food for three weeks, common survival knowledge says you’ll only live for three days without water. Pack it, drink it, and survive. Your phone’s not so “smart” when you’re out of cell service and WiFi range. GPS could be spotty where you’re going. Although there are some great apps and techie travel tools out there, it’s important to have a back-up plan (sadly, phones die, trackers get wet, and tech tweaks out). Bring a physical map and put it into a waterproof container (a Ziploc bag works well). Also, know how to read it! Study the map before you leave for your hike, ride, or raft, and scan it again once you’re there to get your bearings. A compass (which you also need to know how to use) could be a good accompaniment to your map. Your first aid kit just needs to have the basics. There are some great ready-made kits out there that include all the essentials, or you can build your own. Put it in a brightly coloured, waterproof case, and make sure it is small enough that you’ll actually bring it along. As you build your kit, make sure you know what each item is and how to use it properly. During an emergency, you’ll want to access your kit and the items in it as confidently and quickly as possible. Take a Wilderness First Aid or a Wilderness First Responder course to be ultra-prepared if you’re planning a long or technical adventure. What do you notice in your field of vision? What colors and scents pop out to you? ​Take a few moments each day and each week to put down your device, pause for gratitude, and bask in the unrivaled magnificence of the natural world. ​Your core values are a fundamental quality of your personality and sense of who you are. They define the concepts and principles that shape your being and influence your choices throughout the course of your life. Most of the time these values work quietly behind the scenes as they subtly influence your thoughts, speech, and actions. However, on occasion you may find the need to stand up for your beliefs and hold firm to what you believe to be right and true. Doing so in a skillful, conscious, and non-confrontational manner can make all the difference in helping your perspective be heard in a firm, yet compassionate way. Remember, your objective is to stand up for your beliefs, not necessarily change another person’s beliefs. Sometimes, it may be enough to hold your ground and be a voice for what matters to you. Having done so, you can let go of trying to change others and let the universe handle the outcome. Know that every thought, word, and deed that supports the expansion of peace, harmony, compassion, justice, honesty, truth, and love influences the collective consciousness of the world.